XICHANG, Sichuan Province -- China launched a new communications satellite, Zhongxing-9, from the Xichang Satellite Launch Center in the southwestern Sichuan Province at 8:15 p.m. (Beijing Time) Monday. 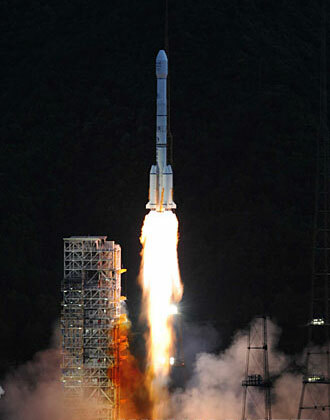 The satellite was shot into space aboard the Long March-3B rocket carrier. 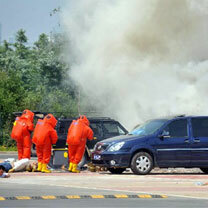 It was the 107th launch mission for the Long March series of carrier rockets. Zhongxing-9, a satellite ordered by China Satcom from the France-based Thales Alenia Space, would be used for live television broadcast and put into use before the Beijing Olympic Games in August. Audiences would be able to watch live broadcasts of Olympic events via the satellite. The quality and coverage of the country's television and broadcasting services were to be increased, and people in remote regions of China would receive clear television programs. The China Great Wall Industrial Corporation (CGWIC), the contractor of the satellite launch, signed the launch service contract with China Satcom in November 2005. As the only company engaged in international commercial satellite launching services, CGWIC has launched 34 foreign satellites for 28 services.